The KellerOnline® Safety Management Tool hosts one of the largest community forums dedicated to safety professionals where you can share ideas, knowledge and expertise or get candid, practical feedback from thousands of your peers in the industry. Tap into the history and knowledge of thousands of safety professionals in an open forum environment. "KellerOnline is a great resource for information and tools and well worth the cost. I have had the opportunity to rely on both my peers and the J. J. Keller experts to answer questions that I had – this opportunity alone makes the return great for me." 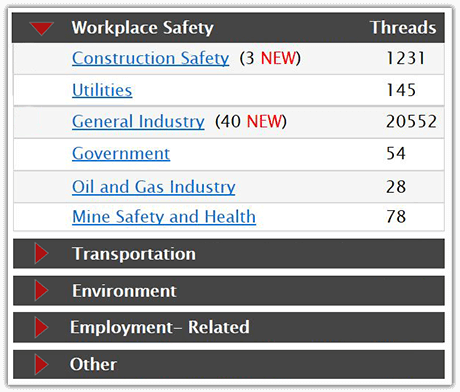 Member Discussions in KellerOnline are organized by major topic headings such as "workplace safety" or "transportation" and then by regulatory areas such as "general industry" or "construction safety." Once inside a discussion area, discussions are listed with the most recently posted discussion at the top. Within an individual discussion, the most recent message posted to the discussion will be listed at the bottom. Get the answers you need to your specific compliance-related questions! Sign up for a free trial today!